Super Lage und schönes Quartier. You´ll find this elegant and chic apartment in a recently renovated building of holiday rental apartments, right in the city centre of Barcelona, conveniently located for those looking to enjoy all that the city has to offer. Situated in the popular neighbourhood of Eixample, this wonderful apartment can be found just a short 10-15 minute walk from some of the best sights in Barcelona, such as Passeig de Gràcia, Plaça Catalunya and Las Ramblas. You can also reach other areas of the city and the suburbs via public transport from this extremely well-communicated and centric location. 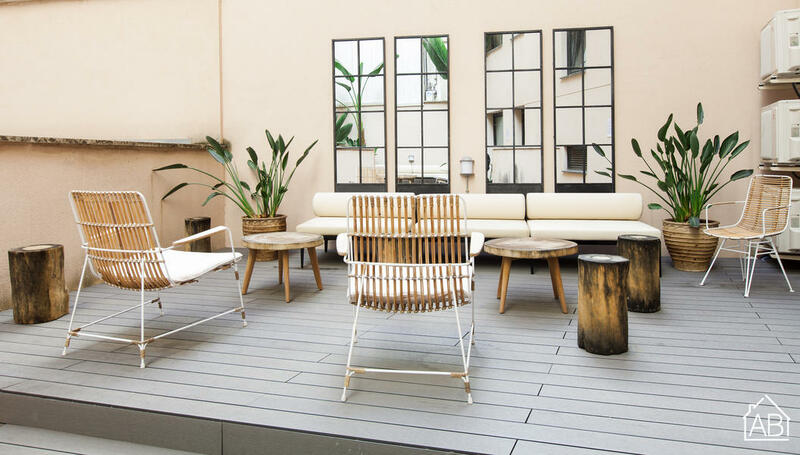 This apartment is perfect for the whole family or a large group coming to Barcelona. It has 3 bedrooms and 2 bathrooms in total. You´ll find 1 bedroom with a double bed, 2 bedrooms with a bunk bed in each, as well as a double sofa bed, allowing up to 6 guests to stay here comfortably. What´s more, there´s even a communal terrace with tables, chairs and sun loungers for you to enjoy. There is 1 bathroom with a combined bathtub-shower and a luxurious, massaging shower stall in the other bathroom. With your fully-equipped kitchen, modern living area and balcony, you can be sure to make the most of your stay. There are plenty of amenities, too, such as a dishwasher, washing machine, Internet connection and satellite TV. This apartment really makes for the ideal home-away-from-home for the modern traveller. The apartment block has a reception, open 09h-18h weekdays.